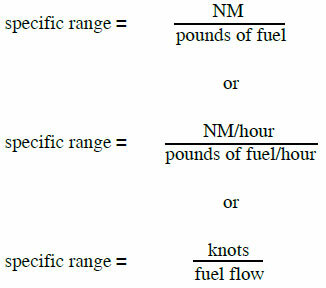 A common element for each of these operating problems is the specific range; that is, nautical miles (NM) of flying distance versus the amount of fuel consumed. Range must be clearly distinguished from the item of endurance. Range involves consideration of flying distance, while endurance involves consideration of flying time. Thus, it is appropriate to define a separate term, specific endurance. Fuel flow can be defined in either pounds or gallons. 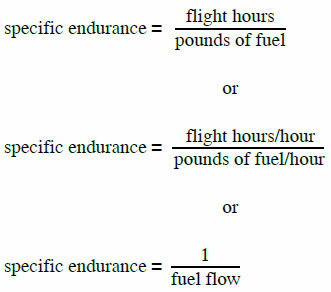 If maximum endurance is desired, the flight condition must provide a minimum fuel flow. In Figure 11-11 at point A, the airspeed is low and fuel flow is high. This would occur during ground operations or when taking off and climbing. As airspeed is increased, power requirements decrease due to aerodynamic factors, and fuel flow decreases to point B. This is the point of maximum endurance. Beyond this point, increases in airspeed come at a cost. Airspeed increases require additional power and fuel flow increases with additional power. Cruise flight operations for maximum range should be conducted so that the aircraft obtains maximum specific range throughout the flight. The specific range can be defined by the following relationship. The external aerodynamic configuration of the aircraft. These are the source of range and endurance operating data included in the performance section of the AFM/POH. Cruise control of an aircraft implies that the aircraft is operated to maintain the recommended long-range cruise condition throughout the flight. Since fuel is consumed during cruise, the gross weight of the aircraft varies and optimum airspeed, altitude, and power setting can also vary. Cruise control means the control of the optimum airspeed, altitude, and power setting to maintain the 99 percent maximum specific range condition. At the beginning of cruise flight, the relatively high initial weight of the aircraft requires specific values of airspeed, altitude, and power setting to produce the recommended cruise condition. As fuel is consumed and the aircraft’s gross weight decreases, the optimum airspeed and power setting may decrease, or the optimum altitude may increase. In addition, the optimum specific range increases. Therefore, the pilot must provide the proper cruise control procedure to ensure that optimum conditions are maintained. Total range is dependent on both fuel available and specific range. When range and economy of operation are the principal goals, the pilot must ensure that the aircraft is operated at the recommended long-range cruise condition. By this procedure, the aircraft is capable of its maximum design-operating radius or can achieve flight distances less than the maximum with a maximum of fuel reserve at the destination. A propeller-driven aircraft combines the propeller with the reciprocating engine for propulsive power. Fuel flow is determined mainly by the shaft power put into the propeller rather than thrust. Thus, the fuel flow can be related directly to the power required to maintain the aircraft in steady, level flight, and on performance charts power can be substituted for fuel flow. This fact allows for the determination of range through analysis of power required versus speed. 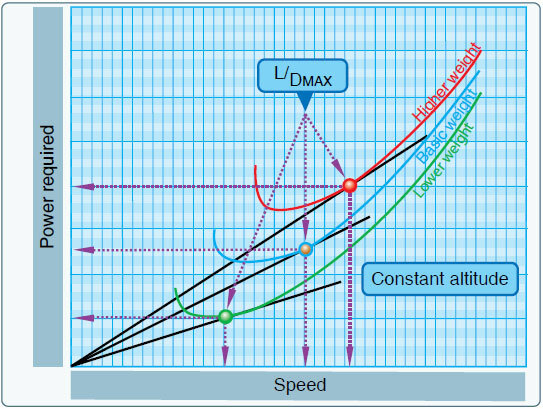 The maximum range condition is obtained at maximum lift/ drag ratio (L/DMAX), and it is important to note that for a given aircraft configuration, the L/DMAX occurs at a particular AOA and lift coefficient and is unaffected by weight or altitude. 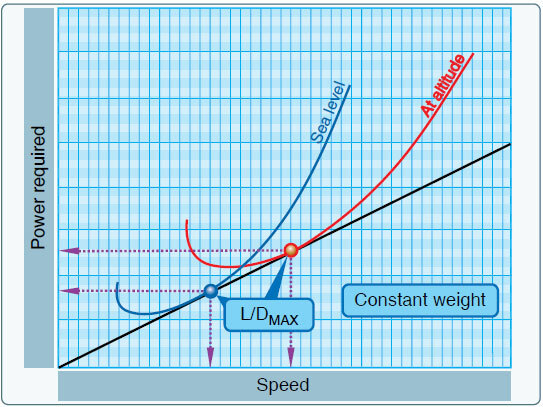 A variation in weight alters the values of airspeed and power required to obtain the L/DMAX. [Figure 11-12] Different theories exist on how to achieve max range when there is a headwind or tailwind present. Many say that speeding up in a headwind or slowing down in a tail wind helps to achieve max range. While this theory may be true in a lot of cases, it is not always true as there are different variables to every situation. Each aircraft configuration is different, and there is not a rule of thumb that encompasses all of them as to how to achieve the max range. Figure 11-12. Effect of weight. The variations of speed and power required must be monitored by the pilot as part of the cruise control procedure to maintain the L/DMAX. When the aircraft’s fuel weight is a small part of the gross weight and the aircraft’s range is small, the cruise control procedure can be simplified to essentially maintaining a constant speed and power setting throughout the time of cruise flight. However, a long-range aircraft has a fuel weight that is a considerable part of the gross weight, and cruise control procedures must employ scheduled airspeed and power changes to maintain optimum range conditions. The effect of altitude on the range of a propeller-driven aircraft is illustrated in Figure 11-13. A flight conducted at high altitude has a greater true airspeed (TAS), and the power required is proportionately greater than when conducted at sea level. The drag of the aircraft at altitude is the same as the drag at sea level, but the higher TAS causes a proportionately greater power required. Figure 11-13. Effect of altitude on range. NOTE: The straight line that is tangent to the sea level power curve is also tangent to the altitude power curve. The effect of altitude on specific range can also be appreciated from the previous relationships. If a change in altitude causes identical changes in speed and power required, the proportion of speed to power required would be unchanged. The fact implies that the specific range of a propeller-driven aircraft would be unaffected by altitude. Actually, this is true to the extent that specific fuel consumption and propeller efficiency are the principal factors that could cause a variation of specific range with altitude. If compressibility effects are negligible, any variation of specific range with altitude is strictly a function of engine/propeller performance. An aircraft equipped with a reciprocating engine experiences very little, if any, variation of specific range up to its absolute altitude. There is negligible variation of brake specific fuel consumption for values of brake horsepower below the maximum cruise power rating of the engine that is the lean range of engine operation. Thus, an increase in altitude produces a decrease in specific range only when the increased power requirement exceeds the maximum cruise power rating of the engine. One advantage of supercharging is that the cruise power may be maintained at high altitude, and the aircraft may achieve the range at high altitude with the corresponding increase in TAS. The principal differences in the high altitude cruise and low altitude cruise are the TAS and climb fuel requirements.